I interviewed Tim Sinclair in Episode 015. During the interview, Tim mentioned that he had gone through the inaugural class of the Ocean Accelerator. He also mentioned that Ocean is a faith-based tech accelerator. I had never even considered the intersection of faith-based organizations and tech accelerators and was immediately intrigued. I asked Tim if he could put me in touch with Ocean, which he did. Scott Weiss is the CEO of Ocean, and James Clair is the Marketing Manager. UPDATE: Ocean came out with important news for potential applicants just before the podcast release. They have increased their seed funding for companies accepted into their 2017 class from $35,000 to $50,000. Everything was already in place for the episode release when the news came out, and it would have been difficult to alter the audio to make the change. Click any timestamp on this web page to start listening at the noted time. 805 Creative – According to the website, 805 Creative is an “Ohio-based creative agency dedicated to empowering our business partners with compelling ways to communicate their stories.” Listen or read at [spp-timestamp time=”44:49″]. Business Canvas Map – Also known as the Business Model Canvas. A strategic management template for visualizing a business’s partnerships, resources, revenue, and customers. Ocean’s program provides mentoring through the canvas creation process, focusing specifically on planning, the business model, the strategy canvas, and value proposition. Listen or read at [spp-timestamp time=”19:48″]. CincyTech – “A trusted partner for high potential technology companies in Southwest Ohio,” according to the official website. Scott Weiss mentions it to emphasize the many organizations surrounding Cincinnati which make it an ideal place for entrepreneurs. Listen or read at [spp-timestamp time=”48:20″]. Cintrifuse – Cintrifuse is Located in the Cincinnati, Ohio area. According to the website: “Cintrifuse acts as a connecter and supporter to create a global destination for entrepreneurial success. Cintrifuse connects the region’s high-potential, venture-backable startups to advice, talent, funding, and customers.” According to Scott Weiss: “Cintrifuse’s role is to coordinate all the activities, to minimize wasteful redundancy, and to get everyone in this broad region, which includes northern Kentucky and southeastern Indiana and southwestern Ohio, to work cooperatively so that we share resources and share programming.” Listen or read at [spp-timestamp time=”50:02″]. Lean Startup – Business development method pioneered by Eric Ries. Lean Startup’s methodology is built on the principle that designing products to meet the needs of early customers can prevent many product failures and funding expenses in the future. The claim gained widespread renown after the publication of Ries’ bestseller, The Lean Startup: How Today’s Entrepreneurs Use Continuous Innovation to Create Radically Successful Businesses*. Listen or read at [spp-timestamp time=”32:25″]. Ocean – Ocean is an independent tech accelerator that is uniquely faith-based and focused on building founders. Ocean application – Ocean’s application window is (currently) September 1 to October 31. Listen or read at [spp-timestamp time=”52:37″]. Ocean Capital – Ocean Capital is a separate legal entity from the Ocean Accelerator but affiliated with the accelerator. It collects money from a broad range of investors. It puts money it into convertible notes for the companies in the accelerator. When investors get a return, the entity tracks the flow of money so that investors can be properly taxed. The entity does not have investment profits and losses. Listen or read at [spp-timestamp time=”37:29″]. [spp-timestamp time=”00:16″] Scott Weiss: One of the benefits of Ocean for any startup is [that] our demo day is on a large auditorium stage in one of the Crossroads buildings. 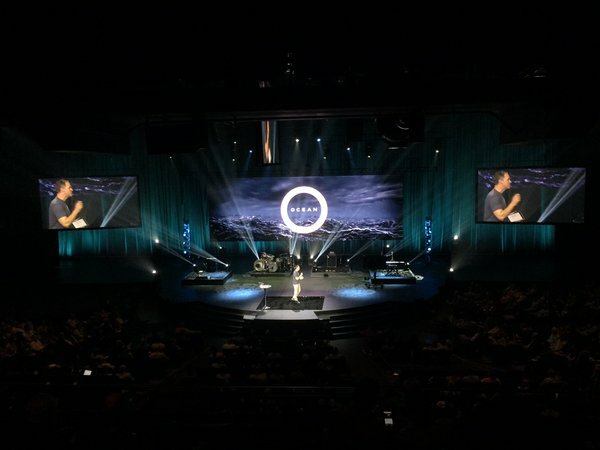 This past year, we had 1,400 people attend live. We had 1,800 people stream it live. So that’s a total live audience of over 3,000. Last year, after we finished, we posted the stream (the stream’s downloadable). Ten thousand people downloaded the stream between last year’s demo day and this year’s demo day. So, if you’re launching a business, you get to come here. You get to go on a stage designed to speak to thousands. You get [a] professional production team fine-tuning your speech. You’re streamed live. Your slides are amazing. You get to launch your brand to, literally, thousands of potential customers and hundreds of potential investors. We work real hard to make sure that the audience has a high percentage of angels, angel funds, and customers. [spp-timestamp time=”01:32″] Ron Gaver: Hello and welcome to the show! I’m your host Ron Gaver. This is the podcast designed to help you put the pieces of the puzzle together to start, grow, and succeed in your SaaS business. [spp-timestamp time=”01:44″] Ron Gaver: Before we get into the show, I would like to personally invite you to visit our website. 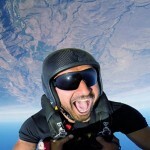 The URL is SaaSBusinessPodcast.com. When you visit, please be sure you sign up to get the FREE Resource Guide. This is a living guide that grows with the podcast. By signing up, you will always have access to the latest edition. [spp-timestamp time=”02:01″] Ron Gaver: For each show, you will also find extensive show notes on the website. Show notes now contain ALL links for resources mentioned in a show, an outline of the show, and a full transcript. I have designed these show notes to help you quickly find valuable information. To get to show notes, just enter the base URL, a forward slash, and the three-digit episode number. [spp-timestamp time=”02:22″] Ron Gaver: This podcast, the Resource Guide, and show notes are produced at considerable expense. They are my gift to you for your continuing growth and success. 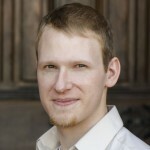 [spp-timestamp time=”02:37″] Ron Gaver: I interviewed Tim Sinclair in Episode 015. During the interview, Tim mentioned that he had gone through the inaugural class of the Ocean Accelerator. He also mentioned that Ocean is a faith-based tech accelerator. I had never even considered the intersection of faith-based organizations and tech accelerators and was immediately intrigued. I asked Tim if he could put me in touch with Ocean, which he did. Scott Weiss is the CEO of Ocean and James Clair is the Marketing Manager. Welcome Scott and James. [spp-timestamp time=”03:07″] Scott Weiss: Hey, how are you? [spp-timestamp time=”03:08″] Ron Gaver: Just fine, and you? [spp-timestamp time=”03:10″] Scott Weiss: We’re doing great up here. Thanks. [spp-timestamp time=”03:12″] Ron Gaver: Good. Alright, well let’s get right into it. For the sake of the audience: not everyone may fully understand exactly what an accelerator is, what you do as an accelerator; and then, beyond that question, I would like to know how Ocean is different. We’ll get into that, I’m sure, in a great deal of detail; but, first of all, what is an accelerator from your point-of-view, and what is an accelerator’s purpose and function? [spp-timestamp time=”03:37″] Scott Weiss: That’s a great question. I’ll lead off. So, let’s start with the founder. The founder has a great idea, and they work on it, they tinker on it, they devote themselves to it, and it gets to a point where they need some help; and that’s the role of investors. Whether they be friends, family, or angels, the capital they provide enables the idea to continue to move forward. 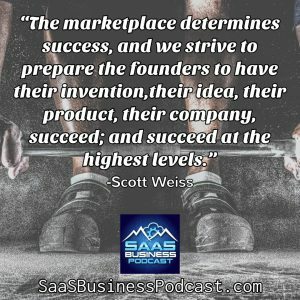 [spp-timestamp time=”04:01″] Scott Weiss: Accelerators do two things: we provide a roadmap that allows the entire thing to accelerate—to speed up, to compress a year of business growth into a few months; and, secondly, we provide access to mentors that will enable the founder to have a far greater circle of knowledge than they have alone. There’s about 220 accelerators in the United States, and all of them do that. Most of them, including Ocean—ours—also provide a level of seed funding—a small amount of money that allows the founder to relocate and participate residentially in that accelerator, as well as enough money to keep the enterprise going. In essence, that’s—from my —what an accelerator does. [spp-timestamp time=”04:54″] Ron Gaver: Alright, then, you mentioned the aspect of capital. [spp-timestamp time=”04:58″] Scott Weiss: Mmhm. [spp-timestamp time=”04:59″] Ron Gaver: And so with the capital usually comes something on your end—there’s a bit of dilution as far as the founder’s ownership of the company, generally. Is that true across the board, or is it not? [spp-timestamp time=”05:10″] Scott Weiss: Well, actually, there’s a narrow range of what accelerators that provide capital get in exchange for that capital. Let’s start with Ocean, the accelerator that James and I are honored to work for. Our note, when the company accepts it, is a convertible note. It’s debt. It does not dilute the cap table. It maintains their equity ownership. And if that company raises subsequent money, the holders of the note—which is a separate guy who manages all that—determines whether or not we want to convert that note into equity at that time or simply get our money back with a modest interest rate. So that’s a very “founder-friendly” capital structure. On the other end, accelerators will take anywhere from 6-10% direct equity in the company in exchange for the capital they’re investing. That begins the dilution process for the founder, because they’re giving up direct shares or direct equity for the money. [spp-timestamp time=”06:14″] Ron Gaver: Well that’s good. I didn’t understand what the “convertible note” part meant. Now I understand. And that sounds like an excellent option for the founder to basically be able to pay that back if he or she so desires. [spp-timestamp time=”06:27″] Scott Weiss: Well, to be clear, it’s if the investor so desires. [spp-timestamp time=”06:30″] Ron Gaver: Oh, okay. [spp-timestamp time=”06:32″] Scott Weiss: It’s the investor’s choice. I’m not an investor in our fund because I work there, but if the investors say, “Hey, we really like Ron’s company, and we want to convert our debt into equity.” Boom! That happens. Or they say, “We really like Ron, but the company’s not our cup of tea. We’ll just take out money back.” And it’s money back with a very low interest rate. So the investor chooses, not the founder. [spp-timestamp time=”06:54″] Ron Gaver: Okay, and what did you say the dilution is, usually, on that, in your case? Or does it vary? [spp-timestamp time=”06:59″] Scott Weiss: There is no dilution with a convertible note. It only dilutes if it converts and the terms of the conversion are spelled out based on the amount of funds raised, so if the company goes out and raises money with an evaluation of three million bucks, and you’ve got fifty thousand dollars in seed capital from an accelerator that converts at fifty thousand, you can see that the dilution would be very, very modest. [spp-timestamp time=”07:23″] Ron Gaver: Alright. I didn’t understand, then. I’m sure that there are others who would not have understood that. [spp-timestamp time=”07:28″] Ron Gaver: So, we’ve talked, just briefly, about what an accelerator is, and how it functions (at least, peripherally). Now I’d like to talk about how Ocean is different. I realize, from your webpage and from talking to you and from talking to Tim Sinclair (who went through your program), there were three founders, originally. They’re Tim, Tim, and somebody else whose name was never actually documented on that page. [spp-timestamp time=”07:53″] Scott Weiss: Chad. [spp-timestamp time=”07:54″] Ron Gaver: Those were your three founders? 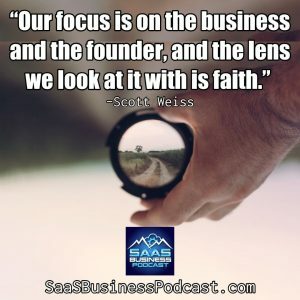 [spp-timestamp time=”07:56″] Scott Weiss: Tell you what: let me back up and just tell you what makes us different, and then we’ll jump into the story of how we got here. [spp-timestamp time=”08:01″] Ron Gaver: That’s great. [spp-timestamp time=”08:02″] Scott Weiss: Perfect. I’ll prattle on a little bit more, and then I’ll let James jump in. [spp-timestamp time=”08:07″] Scott Weiss: So, we’ve already covered in very high-level, broad strokes, what an accelerator is. The other important perspective is: there are 220 accelerators in the United States, and there are over 1,000 incubators. Let’s go sidewise. Very high-level—the difference between an accelerator and an incubator is that accelerators tend to be time-limited. You get accepted, and you get so many months in the program, and then you get out; and accelerators tend to give you money. Incubators generally have no time limit. You get in and you stay as long as you are getting value from the incubation. And, generally, you pay the incubator. Almost every university in the United States has an incubator, and students have access to it, but they’re paying for it with tuition dollars in order to that incubator. 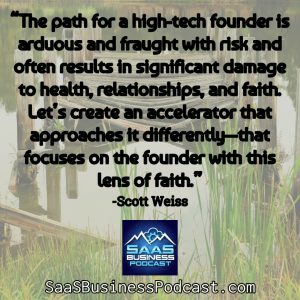 [spp-timestamp time=”09:05″] Scott Weiss: So there are 1,400 organizations out there trying to help high-tech entrepreneurs grow businesses faster, and we’re just like all of them. We’re just one of 1,400 and we think we’re pretty good (and we can talk about that later), but what makes us different—what makes us truly unique—is we are one of only two accelerators in the United States that integrate a spiritual journey with the business journey we take you on. And we do that because our focus is not exclusively on the business. Our focus is on the business and the founder, and the lens we look at it with is faith. [spp-timestamp time=”09:45″] James Clair: Yeah, to pop in and add onto what Scott was saying: when Scott was laying out exactly what an accelerator is, you can think of it like putting guard rails around an entrepreneur or packaging a program for an entrepreneur, to accelerate their business; not a package or a program for a business that leaves out the entrepreneur. All of our curriculum and program—its scope is centered on the founder as an individual because we understand that they have the ability to create multiple ventures that are successful. And they also have the ability to recover from a failed venture versus most businesses and products that don’t get off the ground. Unfortunately, most of them never recover. [spp-timestamp time=”10:33″] James Clair: So, this sustainability and life expectancy of a founder is much, much more valuable than an individual idea, and, like Scott said, our difference is that lens of faith. And you can think of it like an orientation point. So a lot of decisions are made, unfortunately, with a motivation for financial gain, as the first thought or sole inspiration. We believe that Scripture clearly lays out that God, and the disciplines and principles that He taught, are what should be our initial point of inspiration, and that financial decisions are simply a filter that we run those following decisions through. So, we don’t want to tether ourselves to our money. 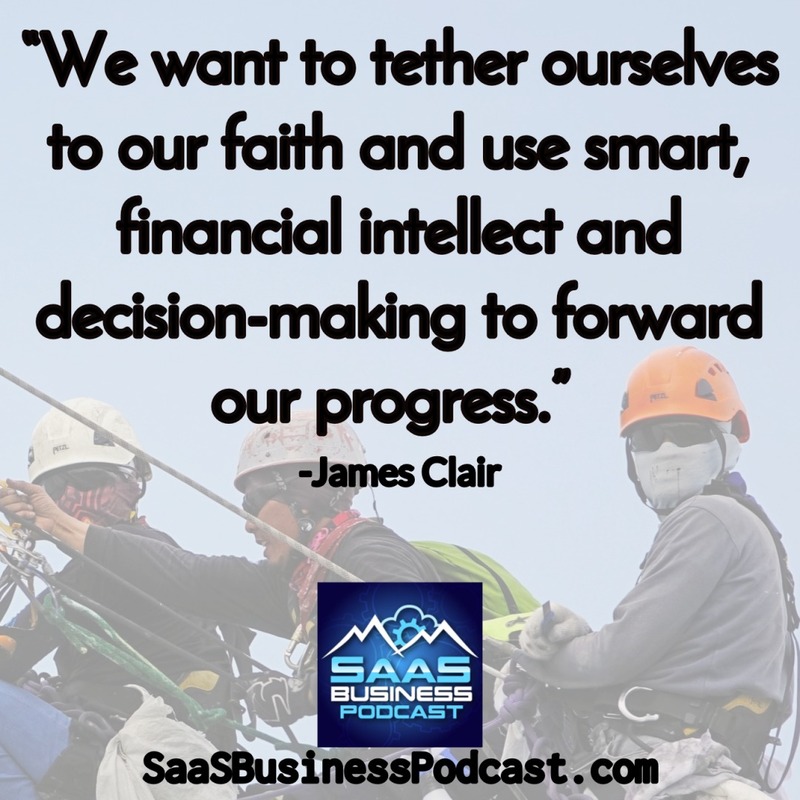 We want to tether ourselves to our faith and use smart, financial intellect and decision-making to forward our progress. [spp-timestamp time=”11:29″] Ron Gaver: Alright, I understand, and I think that I would certainly embrace having your faith at the center of all that you do and having God at the center of all that you do. [spp-timestamp time=”11:39″] Ron Gaver: So you’re trying to focus more on the founder. Not only on the business, but also on the spiritual, the physical, the relational, and the intellectual because, you say, essentially, that the founder has a greater shelf life than any business, potentially. [spp-timestamp time=”11:53″] Scott Weiss: Well said. [spp-timestamp time=”11:55″] Ron Gaver: And then you explore the role of faith. One of your founders said that that is, arguably, the proper place for faith to be put in building the business and putting it all together, and so you’re trying, also, to build the person up, strengthen that person, and edify that person to bring the spiritual to bear on that person’s business so that that person is a more graceful founder or can more gracefully transition into that business and not burn out in the process? [spp-timestamp time=”12:27″] James Clair: Yeah, exactly, because, oftentimes, we can forget that there are non-business-related relationships at stake—most notably family, friends. So if we consider the entire amount of stakeholders that exist within an entrepreneur’s idea or their business venture, we want to make sure that we don’t exclude those relationships and the physical health that’s put at risk when a founder, unfortunately, is not tethering their decisions to the right source. A lot of people can identify with what it’s like to lose friends during a business venture, to have lost marriages, to gain weight, to go through physical ailments—a lot of people identify with that. 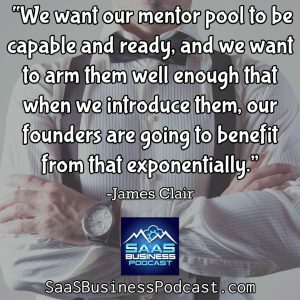 [spp-timestamp time=”13:17″] James Clair: It’s not just the high-tech founders that come through our accelerator, and that’s also another layer to our uniqueness—that our message translates to a vast kingdom. And that’s our mission: to expand God’s kingdom; and we are looking to do it through the marketplace, or into the marketplace through entrepreneurs. But they have the ability to take that with them and transfer that to their families, to their friends, and then to future business associates, well after they’re out of their current venture. [spp-timestamp time=”13:49″] Ron Gaver: I find this idea to be very exciting because, looking at starting a business, one thing I would not be willing to sacrifice—or the things I would not be willing to sacrifice—would be my marriage, my family, and my health. My friends, maybe a little bit after that, but my marriage, my family, and my health—those are the things that God has given me to be a steward over, and those are the things that I must maintain. I have a mandate to do so, and I have a responsibility to do so. The sacrifice that goes along with losing those things is, in my mind, a failed proposition. [spp-timestamp time=”14:26″] Scott Weiss: We would agree. It’s also important for your listeners to know two things. 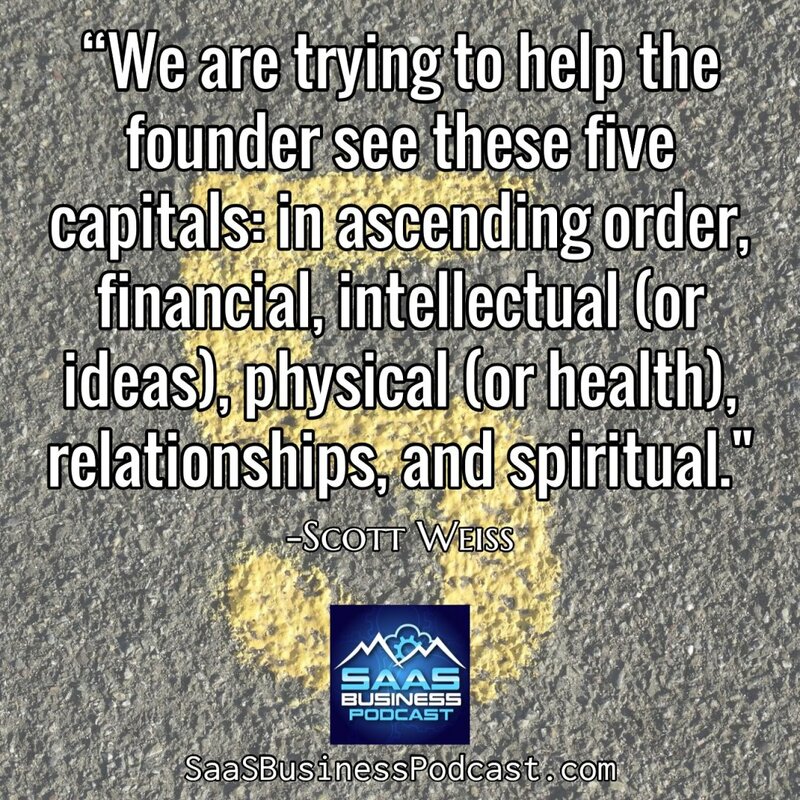 We are trying to help the founder see these five capitals (and you articulated them already): [in ascending order, financial, intellectual (or ideas), physical (or health), relationships, and spiritual]—to see they have all five of these things, in different measure and at different times in their life, and the key to navigating a successful startup is to recognize that you have access to all five capitals. And while you’re watching the business, you don’t need to sacrifice your family, but you are going to impact your family. You simply will have far less time for your family. 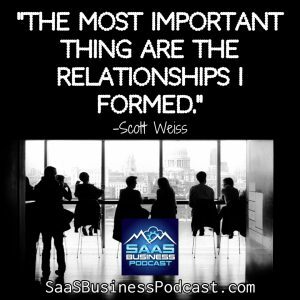 You will need to use many of your relationships to build your business, just to interview them (what do they think about your product? ), to do your pitch, to ask for money possibly, to ask them to become a customer, or ask them to ask friends to become customers. 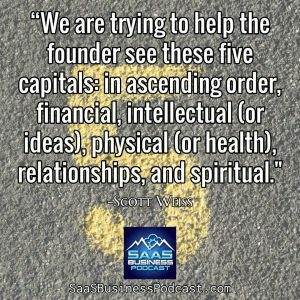 [spp-timestamp time=”15:24″] Scott Weiss: So, we try to help the founders understand: you’re not going to have a balanced life; you’re going to have an unbalanced life. Now, how do you enter that journey, recognizing its imbalance, and come out on the other end with healthy relationships intact? You do that by taking everyone on the journey with you, by over-communicating where you’re heading, by using the other capitals you may have in excess to feed the capitals differently than you normally would. So, while I no longer have the time for the relationships I used to have, I will have access to new learning, new intellectual development, new networks, new people—let me introduce them to my wife, my children, whoever is important in that family. So this is very much an issue of: it’s not about balanced life. It’s about understanding the impact the imbalance it’s going to cause and using the resources available to you to navigate that successfully. It’s a real important concept that often gets lost. I’m just going to carry on, so I’m just going to throw the second thought at you pretty quickly, if that’s OK.
[spp-timestamp time=”16:35″] Scott Weiss: We are very, very focused on the founder, but we recognize the founder comes to us with an idea that ignites his or her passion. They have this idea, they want to create it, they want to see this enterprise enter the marketplace and grow, and hopefully succeed, and hopefully succeed at whatever level’s appropriate for that idea. 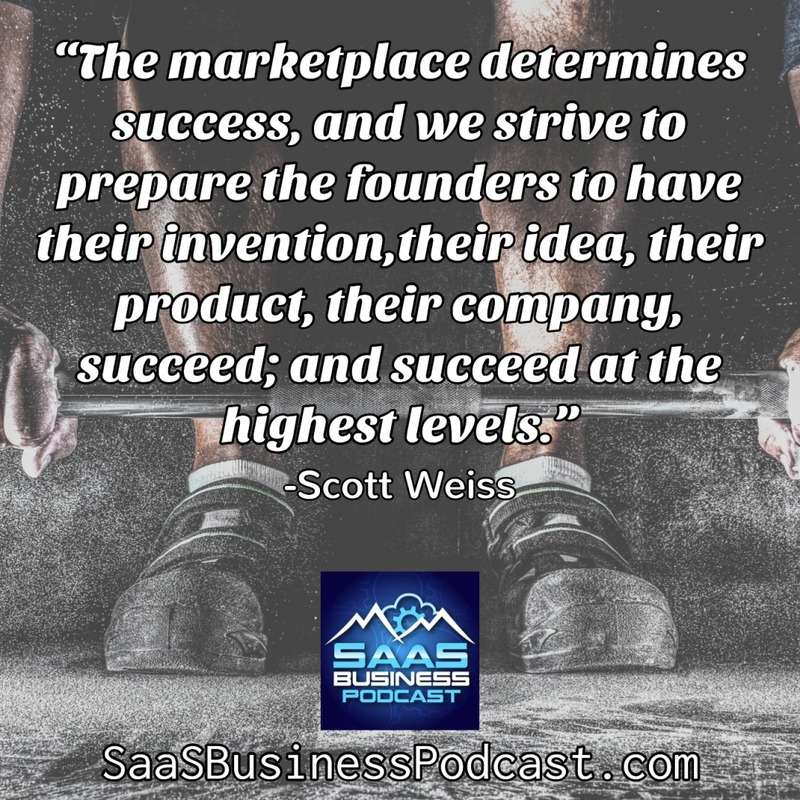 So, we don’t have a different benchmark for marketplace success.The marketplace determines success, and we strive to prepare the founders to have their invention, their idea, their product, their company, succeed; and succeed at the highest levels. We think its excellence is absolutely an affirmation of the gifts God has given you, and using your gifts to deliver excellent results is what we aspire to do. So this has helped the people understand the journey they’re on and to use all the things it’s provided to them and to navigate that journey successfully, and navigate that journey, delivering, an excellent company that delivers excellent results. [spp-timestamp time=”17:41″] Scott Weiss: So, in many ways, when we’re interviewing candidates, we try to help them understand: coming here is more work than going to most accelerators. The outcome is more enriching, more edifying, and you will leave here (if you engage in it) with awareness and knowledge and relationships that we think will serve you the rest of your life, but it’s a lot more work. It’s not easier, it’s harder. [spp-timestamp time=”18:10″] James Clair: Yeah, very much so. Hearing Scott brought to my mind: when God is shining a light in some of our darkest corners—many times, we can be scared, or we can be afraid of what impact and anxiety that’s going to bring to us or to the people around us; but one fruitful piece of our overall mission is that we want to change that feeling for a founder from being afraid and scared to feeling free; and that there’s freedom in identifying these characteristics and behaviors that we have as individuals and how they affect, not just our personal lives, but the success of our business. And, many times, [for] the biggest fault-line in our individual ventures, there’s a relatable behavior that’s reflecting in our personal life; and addressing those realities and really dying to them and bringing truth to what that really should mean for us is what ties together both of those pieces really well. 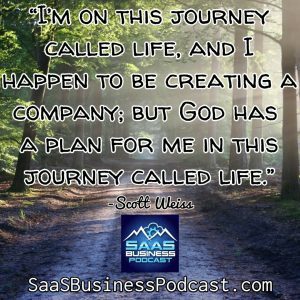 [spp-timestamp time=”19:18″] Ron Gaver: One thing that, Scott, you mentioned, “taking everyone along on the journey”—and I think that that’s a great concept—how do you implement it, though? Do you use it by talking to people more, by demoing your product—is that what you said? By basically involving them as much as possible in this whole process with you? Is that how you do that, or can you elaborate a little on that? [spp-timestamp time=”19:39″] Scott Weiss: Sure, I think I can. Let me paint a pretty clear picture, and this will take just a few words and then I’ll pause and answer any questions. [spp-timestamp time=”19:48″] Scott Weiss: The Ocean program—once you arrive, it’s a four-month program and then demo day occurs and then there’s one month following demo day that we’re all together. And accelerators, while they do the same thing, do it differently; and one way to look at accelerators is there are very unstructured accelerators (you get in and you have access to a bunch of mentors and advisors and customers, and you’re kind of on your own), or you have structured accelerators. We are a structured accelerator. So, the companies arrive, and we have laid out a curriculum that starts everybody at one level and takes them up through, and past demo, day; and it’s a business curriculum that’s built on the business canvas map that really gets them focused on what value they’re creating in the marketplace, validating that value, and getting out there and testing it, and then generating revenue off of it. [spp-timestamp time=”20:44″] Scott Weiss: We have a variety of speakers that come in and talk about that, and entrepreneurs who have both succeeded, and many of whom have failed (or failed once or twice and then succeeded); and they just come in and tell their stories that supplement whatever concept we are focusing on that week. So that’s the business curriculum, and every week there is a speaker on the business side of it to prepare the knowledge base of the founders to accelerate—to run their business more effectively and to grow faster. [spp-timestamp time=”22:20″] Scott Weiss: And then he unfolds all of the worksheets he and his analysts use to determine that. So you’re sitting there, day one, and you’re hearing a live, venture capitalist give you the answer to the quiz. How do you get them to open the door and talk to you about your idea? You tell them the vision and mission of your company in great depth and in a way an investor, or potential investor, can understand it. [spp-timestamp time=”22:44″] Scott Weiss: That’s kind of day one. They all go out to lunch. They have a great time. They come back. And day one, I had a creative director from a local studio there, and he led a session that he called (I think it was a “he”), led a session on, “I believe in God, I believe that God’s a creative force, and I believe God wants me to create, and that’s what it means to be in God’s image.” And all that he talked about was his personal faith journey and how God had come alive in him and given him the courage to step out and create these incredible visual images that multiple clients pay for. 23:21 Scott Weiss: That’s it. That’s day one. [spp-timestamp time=”25:20″] Scott Weiss: We do not select based on your faith. We’ve had Christian believers in the accelerator. We’ve had non-Christians. We’ve had seekers, people who say: “I think I’m an agnostic or humanistic. I’m not really sure. I’m trying to figure this all out.” We’ve had all different religious faiths from the Christian side. We select based on your willingness to go on this journey, and we’re very clear, while we respect where you’re at, understand: the journey we’re laying out for you is from a Christian perspective. We all believe that’s a source of great truth for all of us. [spp-timestamp time=”25:54″] Scott Weiss: So, we’re going to take them out for three days We’re going to have multiple workshops leaders come in. We’re going to have all kinds of exercises, and begin unpacking: “Where are you? Where are you in your walk with God? Are you having one? Are you not? How does that manifest itself? What do you believe?” Then we’re going to come back and do all this business/faith stuff. 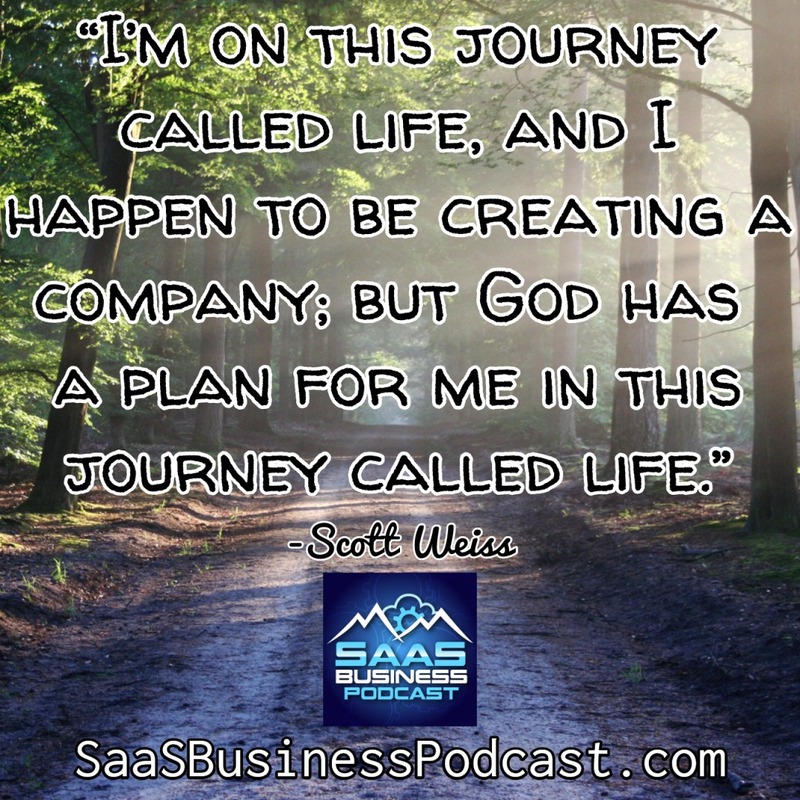 [spp-timestamp time=”26:12″] Scott Weiss: Then, about two months later, we’re going to go away again, and on that weekend sojourn, we’re going to say, “Here are the biblical truths, the biblical principles, we’ve been talking about. How are you going to apply those—if you choose to—in your business?” And we have taken the time to unpack key biblical truths into business principles, and almost all businesses in Judeo-Christian cultures use biblical principles in running their business. Love others as you love yourself. Treat others the way you want to be treated. Treat the customer the way you want to be treated. We get them to unpack that and to write out their objectives for their company so they have specific goals for the culture and company they’re trying to create. [spp-timestamp time=”26:59″] Scott Weiss: Then we come back, we get through demo day, and then we’re going to take them off again. Now they’ve met all these investors, they’ve had this launch. What are they going to do all this as they leave us and launch into the world? How’s this all going to come to life in how they’re going to run a company based on biblical principles that, hopefully, has great commercial success? So it’s an intense, fun, creative process that involves literally dozens and dozens of people, willing to give of their time and talent, who come to us from all over the country to help make this possible. [spp-timestamp time=”27:32″] Ron Gaver: You’ve gotten into some of your program—the actual functioning of the program, month-in/month-out, day-in/day-out, week-in/week-out—and there’s one graphic on your website that is a circle with the formal program in it and you have monthly events, weekly events, and daily events. Could you go into a little bit about how that program works? [spp-timestamp time=”27:45″] Scott Weiss: The weekly events are the series of speakers that I outlined. Every week, we have someone come in and lead a workshop on a business topic that’s aligned with accelerating high-tech companies. We have a speaker come in every week and lead a session on a faith topic, and then every week we have a workshop that integrates them. Every week we have at least one, but generally two, guest speakers for something we call “coffee chats,” and these are founders, these are people who’ve started businesses. Last year, we had a founder from Israel drop in. We’ve had a major leader from Google drop in. We have all kinds of local entrepreneurs. A young man who’s been on shark tank came and talked, and they just tell their story. And we tell them, “This week we’re talking about this business topic and this faith topic.” And they tease out of their story something that’s occurred to them that exemplifies either or both of those topics. [spp-timestamp time=”28:48″] Scott Weiss: Every week we do a community meal. We provide soup (I love soup), and we’ll have all the founders there. Their families are invited. All the mentors are invited. We’ll have all the lawyers who volunteer for us. We’ll have 30-50 people every Friday for a big community lunch and soup, which forces you to sit next to somebody and drink or sip out of a bowel. So, it gets everyone talking, and suddenly we’re not in an accelerator anymore; we’re just doing life. Every week we’ll have optional participation in a Bible study. Every week we’ll have optional physical activity. [spp-timestamp time=”29:25″] Scott Weiss: Daily, we ask each company to journal. We post a journal question up on the board—we’re going to do that differently next year—and the journal question is very much against their faith walk, very much is taking them on a guided journey of questions that, if you went back and read all the answers you wrote to these journal questions, you’d have a pretty interesting diary or chronology of ever-deeper growth and understanding. [spp-timestamp time=”29:52″] Scott Weiss: And then, about two weeks into the program, every week we practice pitches on a stage, with microphones, with slides, leading up to our demo day, which is probably one of the highest-attending demo days in the United States in terms of physical audience size and streaming audience size. So, we do the combination of all those things to make the program entertaining, engaging, creative, and fun. [spp-timestamp time=”30:20″] James Clair: Yeah, it’s important to have those different layers because we want the program to reflect how we live life. There are routines and there are rhythms that we don’t do every day but that we want to make sure we prioritize, and that we make space for, as we go through the journey of the program. 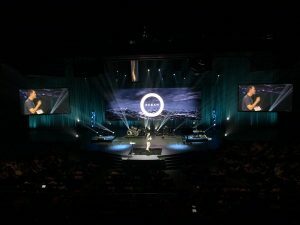 So there’s a key reflection in what we do outside of our businesses and what we do in life, and we put that into the program so then that way, if you don’t have a very good rhythm or routine with spending time journaling or in Scripture every week, we want to almost kick-start that rhythm for you, so that when you leave the program, you’re going to take that behavior with you. Same thing with the encouragement of physical fitness, and then encouragement of getting in a small group and discussing your faith or Scripture. [spp-timestamp time=”31:15″] James Clair: Especially when you’re in a format like we are, we find that routine to be very beneficial because they’re also naturally integrating what they’re currently going through in their companies into whatever topic we’re discussing in the Bible studies. So, the program—although it looks very cool and it’s laid out (we’ve got monthly, weekly, daily)—we could easily eliminate whatever words we put in there for those bubbles and put rhythms and routines in our daily life, and it would make perfect sense to a lot of people. [spp-timestamp time=”31:47″] Ron Gaver: Okay, so the cornerstone of the program is the faith aspect of it, and, of course, you bring in the other speakers who talk about more technical, business-type aspects, and then, on the monthly events, you also get into legal, investment, leadership, and something called “field day.” I’m not sure what that is. 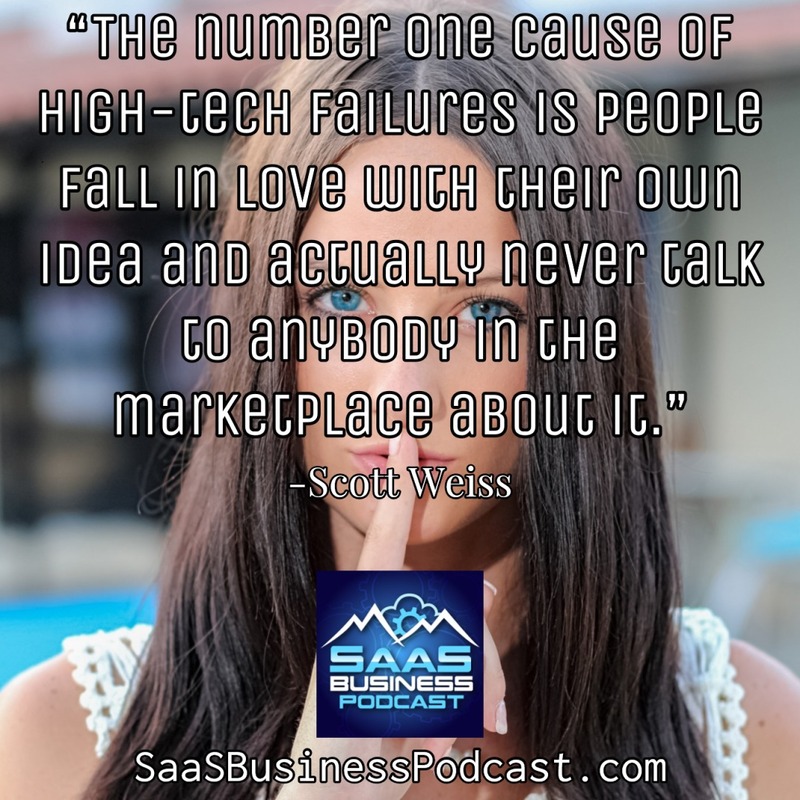 [spp-timestamp time=”32:05″] Scott Weiss: That’s just getting people out to validate their idea in the marketplace. 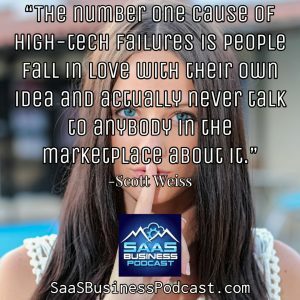 The number one cause of high-tech failures is people fall in love with their own idea and actually never talk to anybody in the marketplace about it; so whatever they’re working on (whether it’s B2C or B2B), we line up time, space, and interviews with the right audience to validate their idea. [spp-timestamp time=”32:29″] Scott Weiss: Exactly. That’s exactly what it means. 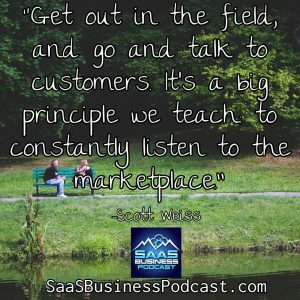 Get out in the field, and go and talk to customers. It’s a big principle we teach: to constantly listen to the marketplace. [spp-timestamp time=”32:39″] Ron Gaver: Hypothetically, let’s say I’m a founder. I’ve been accepted and you’ve made the convertible note available to me, and I’m relocating to Cincinnati for the four-to-five months—well, five months, including the month after demo day—and I’ve got a family. How do the founders usually negotiate that with their families? What do you usually see happening there? [spp-timestamp time=”33:04″] Scott Weiss: That’s a great question. So this past year—our program runs January through May, so we just had our bon voyage party for this year’s class—this past year, there are nine companies that got accepted. We take anywhere from about eight to twelve. It’s hard to get in. There are hundreds of applications that get boiled down to the people we offer to. Of those nine, five were from outside the Cincinnati region. Two of those were from Europe and relocated from the United Kingdom (both were from London, coincidentally) to Cincinnati. One was a single person (and her co-founder popped in and out), and the other was a married gentleman with a wife and two children. [spp-timestamp time=”33:48″] Scott Weiss: The “spouse with children” is a common story from people relocating to Cincinnati or in Cincinnati. About half of our founders tend to be married with family. So, we go through all this in the interview process. We want to understand their game plan. [spp-timestamp time=”34:04″] Scott Weiss: When that individual arrived, we had reached out to our network and we had already lined up twenty or thirty rental properties of people willing to rent to him on a short-term basis. He, from London, envisioned his family being here on two separate times during his five-month sojourn (so they would relocate for an extended period and then they would go home); and then he would fly back and forth from London twice and spend a week there and Skype in or stream in and participate in the program that way. [spp-timestamp time=”34:36″] Scott Weiss: So we helped find housing at a very favorable rate. We then worked with a non-profit that gives away automobiles, and they gave him a car. He’s going to give it back to us when he’s done, and we’ll give it back them, but he had free use of a car for his duration, as did the other person from London (as would anybody relocating here who doesn’t have a vehicle—we would arrange that). And we lay this all out so, when they get here, we know how their family’s going to navigate it, they know how their family’s going to navigate it. When that individual’s family showed up from London, we also had arranged families of our mentors to take time out of their lives, show them Cincinnati, invite them over to their home, take them out to dinner—without imposing, giving the family time, but still being welcoming. That’s how we do it. [spp-timestamp time=”35:24″] Ron Gaver: Showing them great hospitality. [spp-timestamp time=”35:26″] Scott Weiss: Exactly. [spp-timestamp time=”35:27″] Ron Gaver: Now as far as the type of companies that you look for: do you look for any specific type of company—or the one speaker that you referred to last year was looking for people who could clearly articulate their mission—is there a particular type of mission that you focus on when you’re selecting applicants, or is it basically just whatever floats up to the top? [spp-timestamp time=”35:53″] Scott Weiss: We’re very focused on the industry being high-tech because you can accelerate a high-tech company. If we’re making fans, you can’t accelerate because you’ve got to cut molds, you’ve got to make the product, and you have to test the product; but high-tech is coding so we can accelerate. They have to be high-tech. The product has to be at or beyond the MVP stage (minimally viable product stage). We don’t like to start with companies before then because it’s too hard to get them ready for demo day. 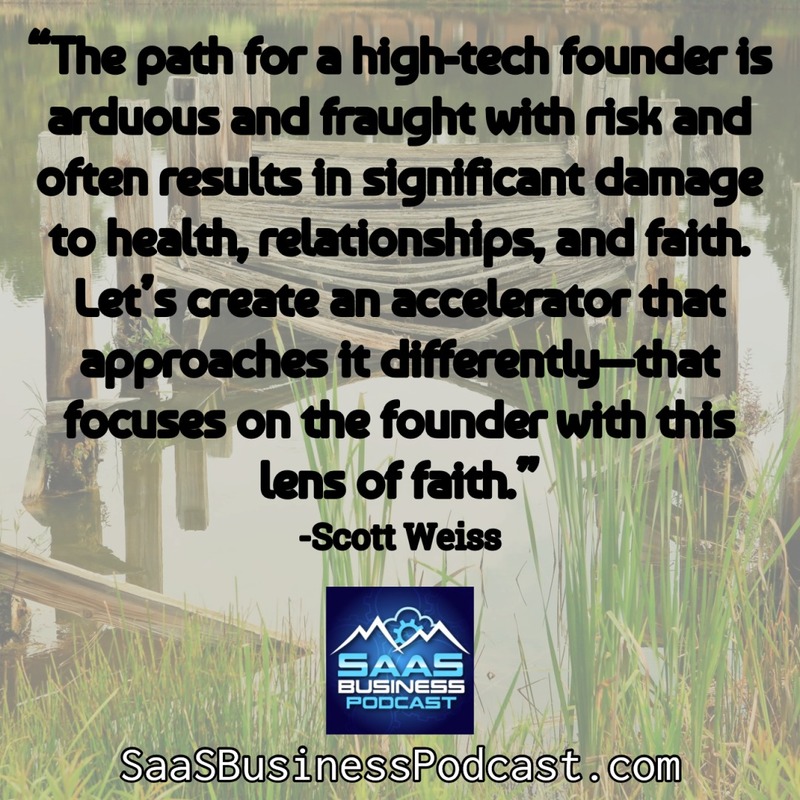 [spp-timestamp time=”36:22″] Scott Weiss: There has to be at least two founders. We won’t take solo founders—it’s just too hard. And they have to be willing to [take], and seeking, this spiritual journey; and we sort that latter piece out in an extended interview either live or via Skype. At this point, we’ve done dozens and dozens and dozens of these, so we have a pretty keen sense when someone’s being honest and sincere in their answers and when, perhaps, they’re just saying they want to do that so they can get in and get the money. So that’s kind of what we look for: high-tech, at least two founders, willing to relocate, product at or beyond the MVP stage, and a sincere and open heart to a spiritual journey. 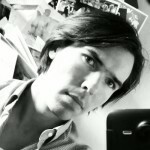 [spp-timestamp time=”37:03″] Ron Gaver: And you also prefer one of the co-founders to be a technical founder, I believe? [spp-timestamp time=”37:09″] Scott Weiss: We skew that way, just for practical reasons, although we’ve taken about a third of the companies where neither was a technical co-founder, but they were able to resolve that issue through outsourcing or hiring a CTO. Chances for commercial success are higher if one of them understands coding and can actually build the product. [spp-timestamp time=”37:29″] Ron Gaver: As far as Ocean is concerned, the accelerator itself is a non-profit organization and then there’s Ocean Capital as well, which is basically the financial end of it. [spp-timestamp time=”37:38″] Scott Weiss: Correct. 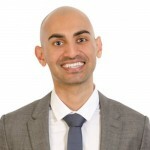 That’s a separate legal entity that, under IRS rules, is an SPV (special purpose vehicle), which means it collects money from a broad range of diverse investors, and its job, as a legal entity, is to track the flow of money so that, when those investors get a return, that they can be properly taxed. The entity itself doesn’t make any profit. It doesn’t lose any. It collects money and puts it into convertible notes for the companies. [spp-timestamp time=”38:07″] Ron Gaver: And as far as Ocean, the accelerator, the non-profit side of that—it grew out of Crossroads (the church), and then an organization within Crossroads called Unpolished, which I believe was a group of business people getting together and talking about business, and then they wanted to do something more. Is that correct? [spp-timestamp time=”38:26″] Scott Weiss: That’s a great story. Unpolished is a group within a large church—very vibrant and active community in Cincinnati called Crossroads Community Church—and this group had coalesced and formed and was meeting monthly and providing speakers; and they’re sitting around one day, brainstorming (it’s a small leadership team): “What else can we do?” And three of the participants in that were high-tech founders—had all founded high-tech companies, and one had had a successful exit (had started a company, grew it, sold it, and was now starting another one)—and those three articulated that the path for a high-tech founder is arduous and fraught with risk and often results in significant damage to health, relationships, and faith, which James talked about earlier. So they said, “Let’s start an accelerator. Let’s create an accelerator that approaches it differently—that focuses on the founder, with this lens of faith we’ve been talking about all afternoon.” And the larger group and the church said, “That’s a great idea!” And Crossroads very generously kick-started the entire campaign with a donation that allowed for the conversion of this old warehouse space into a fantastic co-working space. So that’s how it all started. [spp-timestamp time=”39:41″] Ron Gaver: You say they kick-started it. I read somewhere on your website that they did it with a 2014 Beans and Rice Week? [spp-timestamp time=”39:49″] Scott Weiss: They do a really interesting fundraiser where, every week, they ask their entire community to take on a third-world diet, which is largely vegetarian and beans and rice, and to contribute the difference they would spend normally for food (dining out, buying a first-world diet)—to calculate that and contribute that to Crossroads. Crossroads collects that money, which is a large sum—the first year was like $350,000, last year was $700,000—all of that money, a hundred percent, goes outside Crossroads to support a variety of partnerships or programs, that don’t have any relationship with Crossroads, around the world. It supports building schools in Nicaragua. It supports Ocean. It supports paying to have public swimming pools open in the greater Cincinnati area in a year when the city didn’t have any money to keep the pools open. So they give that all away and we were the very fortunate beneficiaries of some portion of that the first year. [spp-timestamp time=”40:48″] Ron Gaver: Then as the founder arrives—we’ve talked about family accommodations, and that’s something you call concierge, but there’s also really a package of things that you do. We’ve talked about seed financing. We’ve talked about the unique, five-month curriculum with all that that entails. A couple of things we haven’t gone into too much: first, your mentors. You say you have a great pool of mentors, and I’ve seen on your webpage a bunch of pictures of all the different mentors. Could you kind of give a characterization of your cadre of mentors—not necessarily saying “this person, this person, this person,” but the type of people that come and support and want to be a part of this? [spp-timestamp time=”41:29″] James Clair: Yeah, that’s very much the guardrails of the program. We introduce a very diverse mentor—I should first say, we identify and address a very diverse mentor pool—and our goal is to educate them as to what it means to be a mentor in an accelerator space, and what it means to be a coach in an accelerator space where you have nine founders (like we had this last class) but 100 mentors and coaches. Obviously, ten mentors and coaches aren’t going to meet with every founder every week—the capacity of that doesn’t make sense—but it’s the right person at the right time, and that’s where we come in, where we say, “This entrepreneur is at place X, and that’s perfect alignment with this mentor that we have in our pool.” So we’re going to introduce them, and we believe that that mentor is going to help shape [the founder] or help put that founder back on track—or you could even say “introduce a discipline” that will help put the founder back on track—[or] share life experience, and don’t let me make it seem like it’s just business. 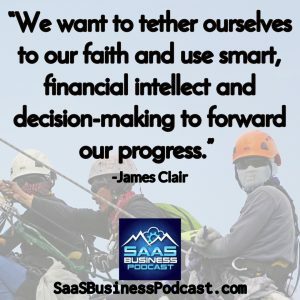 [spp-timestamp time=”42:36″] James Clair: These mentors have voiced that they’re really passionate about sharing their faith journey and their faith story, just as much as their business successes and even business failures. Our mentor pool—they’re not just diverse in the sense of demographically but geographically. Scott has mentioned different mentors and speakers coming in from Israel or East Coast or California, Silicon Valley, the South. That aligns perfectly with our mission of Kingdom expansion globally, and our program speaks to a lot of people, not just in Cincinnati, not just in the mid-West, but [as] we’ve seen in our applicant pool, in the UK. It speaks to people in Europe. It speaks to people around the globe. We want our mentor pool to be capable and ready, and we want to arm them well enough that when we introduce them, our founders are going to benefit from that exponentially. [spp-timestamp time=”43:33″] Scott Weiss: So I would just add, Ron, the mentors will break into two broad groups. All of them want to share their personal life story, their faith journey, and they break then, subsequently, into two groups. We have a large group of subject matter experts—accountants, marketing, product developers, project managers, legal—and then we have a smaller group of people who have started businesses and understand the journey. That smaller group tends to form an intimate, one-on-one relationship. One person from that smaller group will end up being with one of the companies for the whole five months. They’ll be there every week. They’ll have them over their house for dinner. The person who has started the business has the time, the energy, and the maturity in their faith to be able to kind of wrap their arms around a company and be a truth-teller—not to run the business, not to tell them what to do, but to listen and give them honest feedback. Everyone else tends to cluster around tasks, as James pointed out, and we tend to pulse them in and out based on their subject matter and where each company is on any given week. [spp-timestamp time=”44:49″] Ron Gaver: In conjunction with that, you also have some partners—some business partners, law firms, banks, Crossroads itself, an organization called 805 Creative (which is a design and creative production agency). [spp-timestamp time=”45:02″] Scott Weiss: Yep. Companies all get free legal advise the whole time they’re in the program. That’s a combination of the generosity of the University of Cincinnati Law School, which provides legal fellows, and they’re supervised by a local law firm. Last year it was Frost Brown Todd, and it’ll either be them or another great local law firm next year (there’s two law firms that want to do that). And then all these other business partners line up, and they’re very clear: “We will donate this much time.” So the lawyers just said, “We’ll be your lawyers.” Each studio says, “We’ll give you 20 hours.” And, when we line them up with the company, we say, “Okay, you’re asking this agency to do some work for you. And at 20 hours, the clock starts running and you’re paying for it, so let’s get really focused so you can get done what you need done in 20 hours.” That’s what we coach them on doing. [spp-timestamp time=”45:51″] Ron Gaver: One of the objectives of that creation experience is a brand identity kit? [spp-timestamp time=”45:56″] Scott Weiss: Yeah, some of the companies need that. Some do not. This past year, most of the companies had well-established brands and arrived with trademarks in place and graphic design done and operational websites. If the company doesn’t have it, we provide that. If they do have it and want to validate it, we provide that. But most of them have really solid brands. In fact, only one of them needed a lot of branding work this past year. [spp-timestamp time=”46:23″] Ron Gaver: And there’s something called a style guide in there? [spp-timestamp time=”46:26″] Scott Weiss: Yeah, that’s just a tactical tool on design (the product design itself); what the interaction is like if it’s a B2C business (business to consumer). Of the nine companies, almost all of them were B2B (business to business) this past year, so while the style guide is still important, it’s not as profoundly important. [spp-timestamp time=”46:44″] Ron Gaver: So then, they’re there. Are they all basically in one co-located space, and they feed off of one another and thrive on the ideas and inputs from one another? [spp-timestamp time=”47:19″] Scott Weiss: They can then get up and walk from there to multiple places in the building, into a private conference room, all glassed in, and they can jump on a video network feed and talk to a customer anywhere in the world (or anybody anywhere in the world), or they can put a presentation up in a larger conference room and have customers come in. They can walk to other parts of the building, which are just quiet spaces, where you can go work alone on your laptop or sketchpad, or you can go and pray or study. And then we have “huddle” areas—we have couches thrown around with area rugs where [I could go] if I wanted to get four or five people together and just hash something out. Whiteboards everywhere—moveable whiteboards everywhere—and everything’s open. [spp-timestamp time=”48:01″] Scott Weiss: There is no closed space. And everything is reserve-able or schedulable, or if it’s open, just walk in and use it. We then we have a kitchen area that we use for soup day, and we do a happy hour every Friday and about half of them are on our space, and that’s when we set up the beer and the soft drinks and all that good stuff. [spp-timestamp time=”48:20″] Ron Gaver: You’re also big fans of Cincinnati itself. You site various things that are going on in the Cincinnati area and the area around Cincinnati, as far as start-up events, accelerators, incubators, co-working spaces, universities, something called CincyTech, funds and angels groups, economic development, and various associations. You seem to be real community supporters, and (from my point-of-view) you feel Cincinnati is a great place to do this kind of work. [spp-timestamp time=”48:50″] Scott Weiss: Yes. [spp-timestamp time=”48:51″] James Clair: What we do is a reflection of what already exists in Cincinnati, that there is an output now of an entrepreneurial spirit that has existed in Cincinnati for a while, and now there are minds and the intellect coming together and opening up about some of these innovative ideas on how this can work in a place not located on the West Coast. And we embrace the community because—I love that you referenced the beans and rice fast; that is the community of Crossroads Church—it was our catalyst to becoming who we are and opening this space that we’re in. [The community that goes to Crossroads—not eating lavish meals for a week or pausing their grocery trip for a week, and deciding to go deep into their cupboards—sacrificed.] They made that sacrifice so that what we’re doing right now would come to fruition, and I believe that we just simply reflect that in how we speak about our city and how we speak about the community. It’s just an affirmation both ways. This is an output that’s tethered to a Divine source. [spp-timestamp time=”51:23″] Ron Gaver: Would you say that Cincinnati is a family-friendly city? 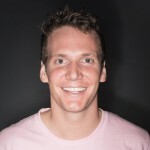 [spp-timestamp time=”51:47″] James Clair: Yeah, and that’s a great point: for the effects that starting and scaling a business have on a married founder—when I think about moving myself from maybe my hometown or home area, across the country to a new city—the way we support that individual founder is just as much as we would the married founder—the one, you know, relationship from a long distance. We leverage Cincinnati as a diverse city that just has this infectious fun about it, and it’s a place where you have an opportunity to do a variety of things no matter, geographically, where you’re from. There’s a lot of things here that are applicable to, not just mid-western, skyline Chili. It’s not all Chili in Cincinnati. There’s, like Scott said, a renaissance that’s really diversified, honestly, Cincinnati’s portfolio as a city. [spp-timestamp time=”52:37″] Ron Gaver: Alright, then as far as Ocean’s schedule for a year, when do you usually open up applications? [spp-timestamp time=”52:43″] Scott Weiss: We’ll be opening up applications in September—very early September; maybe very late August—and that’ll all be announced on our website. We accept applications from (let’s call it) September first to the end of October. We go through our screening process in November and make offers shortly after Thanksgiving [at the end of November] for a class that starts the second week of January. [spp-timestamp time=”53:06″] Ron Gaver: And that begins your cohort, that goes through it, marching down to demo day as the major milestone at the end; and you said it’s a very well-attended—both physically and virtually—event. [spp-timestamp time=”54:42″] Ron Gaver: So demo day comes, and demo day goes, and then your companies are still with you for another month. What happens in that month? [spp-timestamp time=”55:42″] Scott Weiss: So, each company ends up with opportunity coming out of demo day, and we provide support on: “What do you do with that?” And then we also have a few weeks of integrating the entire program back to: “What does this mean for you now in your life? Where do you go from here in your life? The company’s a very important part of that, but you’re a far more important part of that. You are what God cares about. Where are you going to go?” And then we kind of have a ceremony—we call it a bon voyage party—and we launch them. As of this point, about three of the companies have moved on—they’ve left our building; they’ve moved on. One came in and said goodbye today, and the rest are still kind of hanging around, figuring out where they’re going to rent space and all that good stuff. [spp-timestamp time=”56:29″] James Clair: You hit this pinnacle at demo day, and it’s amazing, and the companies do an amazing job. They deliver on the highest stage with the most visibility they’ll ever have at one time, in their young companies. Post-demo day it’s—what Scott said: “What does this mean now? How do I digest this in a healthy way, the feedback that I received from demo day, both good and bad? I retain it as a leave the accelerator.” And that’s really what we’re there for. We’re there to be [sounding boards] and to help them digest and retain feedback from demo day. [spp-timestamp time=”57:08″] Ron Gaver: That was pretty much the end of my list of questions. The next thing that I was going to ask you is: is there anything that you would like to say or cover that I haven’t asked you about yet? 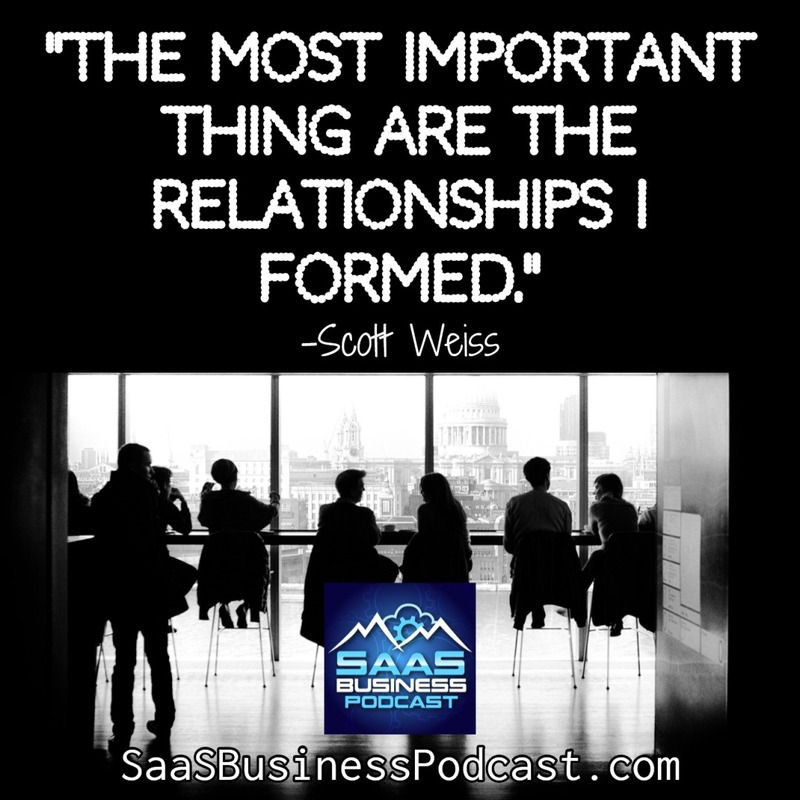 [spp-timestamp time=”57:18″] Scott Weiss: I’m reflecting on this great conversation we’ve had, which I’m so appreciative of. We’ve had a terrific conversation, and for anybody in your audience who listens to it, the universal message is: you, individually, matter. You matter to something much bigger than any of us, and that’s God, and He cares deeply about you, and He cares about your enterprises and your visions and your dreams. And whether it’s a high-tech company trying to get into an accelerator, or someone trying to get an education or someone trying to get a job at a local garage, lean into your gift and lean into it with the knowledge [that] God wants you to utilize that gift to your best ability; and in that leaning into it with the spirit of “what does God want me to do in this,” greater riches will come to you than in any other way in your life. So, our message would just be: lean into the gifts you have, and keep asking yourself, “What does God want me to do in this?” And more will come back to you than you can possibly imagine. [spp-timestamp time=”58:20″] Ron Gaver: Well, thank you very much for your time. I’m sorry for running over a little bit. [spp-timestamp time=”58:25″] Scott Weiss: Thanks a lot, Ron. [spp-timestamp time=”58:26″] James Clair: Thanks, Ron. [spp-timestamp time=”58:39″] Ron Gaver: If Ocean’s program sounds like a good fit for your company, please remember that they will be taking applications for the following year’s class from the beginning of September through the end of October. See the show notes for an application link. 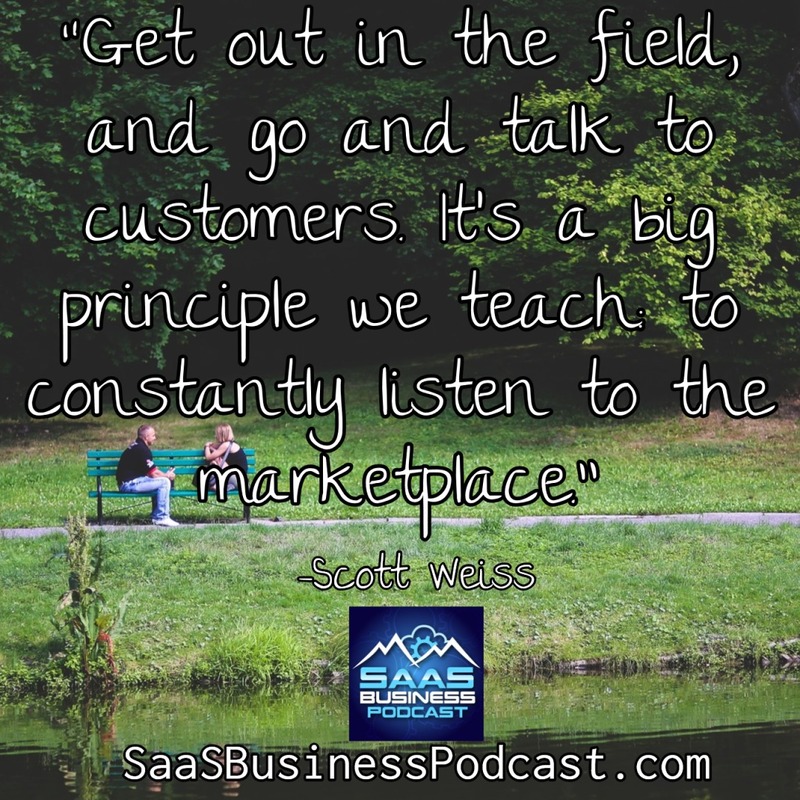 [spp-timestamp time=”58:51″] Ron Gaver: Thanks for listening to the SaaS Business Podcast. 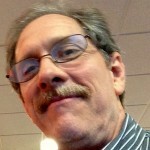 [spp-timestamp time=”58:55″] Ron Gaver: Please remember to take advantage of the show notes and the FREE Resource Guide we have created for you. The show notes page for any episode is SaaSBusinessPodcast.com followed by a forward slash and the three-digit episode number. To get the FREE Resource Guide, just use the Resources tab or any of the forms on the website. [spp-timestamp time=”59:13″] Ron Gaver: If you like what we’re doing, please go to the support tab on the website to learn the various ways you might be able to support us. 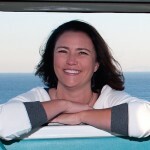 [spp-timestamp time=”59:28″] Ron Gaver: This has been Episode 017 of the SaaS Business Podcast: Ocean, The Tech Accelerator. Thank you, again, for listening. Some of the links on this page may be affiliate links. I may earn a commission if you purchase through these links. These commissions help to cover the cost of producing the podcast. I am affiliated only with companies I know and trust to deliver what you need. In most cases, affiliate links are to products and services I currently use or have used in the past. I would not recommend these resources if I did not sincerely believe that they would help you. I value you as a visitor/customer far more than any small commission I might earn from recommending a product or service. I recommend many more resources with which I am not affiliated than affiliated. In most cases where there is an affiliation, I will note it, but affiliations come and go, and the notes may not keep up.